Early freighters of Central Oregon were hardy men who managed slow plodding horse or mule teams over narrow, dusty, muddy and sometimes hazardous roads. Freight to Central Oregon came by two main routes. Shipments arrived either from the Willamette Valley over the Santiam Wagon Road or from The Dalles along parts of The Dalles to Canyon City wagon road. When the Columbia Southern rail line was built from the Columbia River to Shaniko in 1900, most freight shipments were to and from the rail terminus at Shaniko. The first roads were not much better than cow paths, and passages down canyons were often steep and dangerous. During the dry season, the roads were thick with dust and loose material. Cow Canyon grade descending down from Shaniko Flats to Trout Creek frequently had mishaps as rolling rocks or rattlesnakes would spook the horses, and off they would gallop. There were recorded instances of freighters being killed by wagons overturning as horses raced out of control down the narrow road bank, which was often only a few inches wider than the wheel base of the wagons. During the wet season, travel was particularly strenuous and hazardous. One old time freighter recalled that during a very wet storm he had to pave the roadway with part of his shipment of wool to get the wagons over the ruts and muddy bogs. It also was related that returning freight from The Dalles often included heavy bags of beans bound for Prineville. When a heavily laden wagon became bogged down in the mud, the freighters would off-load bags of beans to lighten the load and use the beans to fill the ruts. Later in the year, plants would sprout from the beans in the ruts and it was a common site to see lines of beans growing along the road. Other trouble spots along early wagon roads included the grade from Antelope to Shaniko, over Grizzly Mountain pass from Hay Creek to Prineville, and Trail Crossing on Crooked River near Crooked River Gorge. 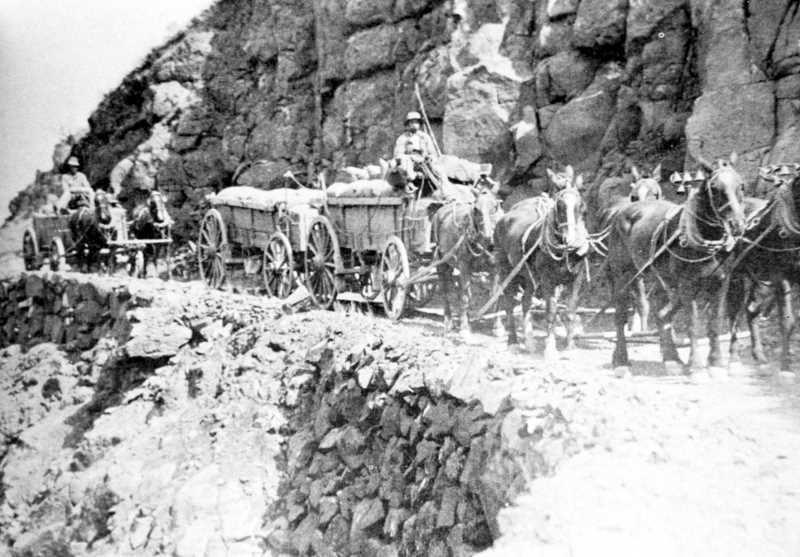 It was also exciting times when wagons traveling in opposite directions met on the narrow canyon roads. Lead horses were often outfitted with bells to signal to other wagons that they were approaching. Freighters often spent several nights under the stars as they brought their shipments to and from Central Oregon. They had to weather storms and drought and negotiate road hazards, but they were critical to supplying the interior of Oregon with necessary goods.